So another Christmas has come and gone and I’m happy to say I got many goodies I’d been hoping for, but not all of them. I don’t mean that there was something I was hoping to get and didn’t, but rather a couple of items that were purchased for me never made it to my door. It seems someone is a bigger fan of Hawaiian shirts than I am as two of them were purchased for me off of my Amazon wishlist, but were stolen or lost along the way. The first was purchased by my wife and the Amazon order says it was delivered on the Tuesday prior to Christmas and left at our front door. I was home and picked up several packages throughout the day, but that wasn’t one of them. She contacted Amazon and got a refund so no worries there. The ghost of Christmas gifts lost. Click to embiggen! The other one is this beauty to the right. I have no idea who purchased it, but it wasn’t Anne. It was bought on the same day that Anne bought the first shirt, December 15th. It never showed up at my door so I’m hoping whoever purchased it had it delivered to their home as it’s a $33 shirt. 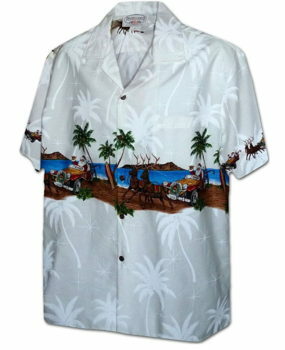 I find it odd that two Hawaiian shirts bought the same day by two different people both failed to arrive at my home. I’m wondering if the UPS guy loves them as much as I do and seeing where they were coming from decided to help himself. I suppose it’s also possible that out of the handful of packages delivered that day someone only managed to steal these two off my front stoop. Regardless of how they were lost, if you purchased that one and didn’t ship it to your home then you will want to contact Amazon and let them know so you can get a refund. Both will be going back on my wish list with hopes they’ll eventually make it to my home. As for the other stuff I got this year, I have a lovely new British Telephone Booth wall cling that can be used as a whiteboard for taking notes, a beautiful handmade Santa Claus cloth figure that my mother-in-law made for me, Civ 6, Final Fantasy XV, and The Last Guardian video games, The Trainable Cat: A Practical Guide to Making Life Happier for You and Your Cat, and a $50 Amazon gift card which I’m sure will be put to good use. What about you guys? Get anything cool for Christmas? 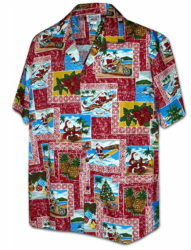 This entry was posted in Holidays and tagged Christmas, Hawaiian Shirts, Holidays by Les. Bookmark the permalink. Well it sounds like a happy Christmas despite the shirts. I certainly can’t complain. I got to spend it with people I love and got to enjoy a vacation at the same time. The cats are going to be so upset come next Tuesday. I approved the above comment as a reminder of the importance of remembering to take your medication. I think this poor guy had a stroke part of the way through his comment.